Demonstrators march near the Illinois State Capitol building in Springfield. A group of 31 people was arrested Tuesday night after refusing to leave the building once it closed. A Northwestern student was arrested Tuesday night outside Republican Gov. Bruce Rauner’s office after joining a protest to highlight the negative ramifications of Illinois’ historic budget impasse. Medill senior Scott Brown, a former Daily staffer, was among 31 people arrested and charged with trespassing after they attempted an all-night protest at the Capitol. More than 300 demonstrators flooded the state building — including seven other NU students — to demand a budget from legislators on both sides of the aisle. The demonstration marked the culmination of a 200-mile march to Springfield that began on May 15 in Chicago. Brown, who helped lead the event, said he hoped it would draw more attention to the budget stalemate. 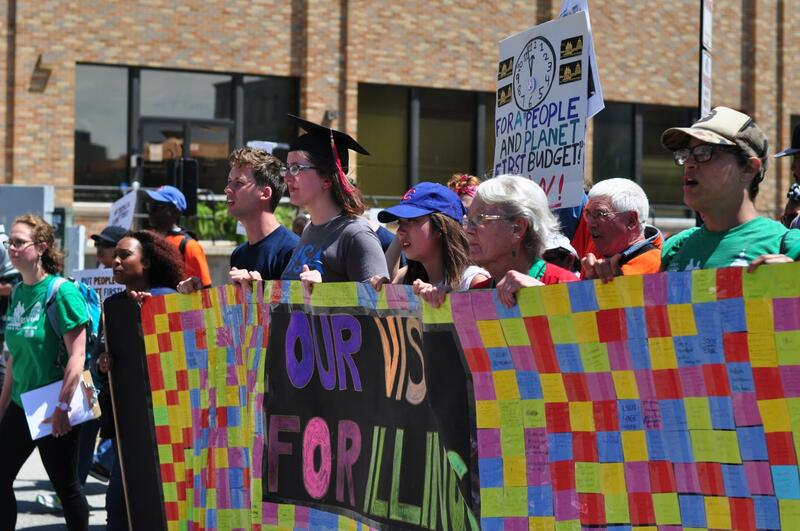 “This is what it’s come to: while our government’s failure has caused untold pain across the state of Illinois, the people who are trying to bring some sanity and make things right wind up getting arrested,” Biss said in the post. Secretary of State spokesman Henry Haupt told The Daily once legislators adjourned at roughly 9 p.m., the public had an hour to leave the building. Still, he said, about 75 people refused to vacate and police then ordered them to disperse. Thirty-one of those protesters remained and were subsequently arrested in connection with trespassing to State Supported Property, a misdemeanor. The protest came as lawmakers approach a critical legislative deadline; they have until midnight to pass a budget by a simple majority, after which it will take a three-fifths majority. The state has been without a budget since 2015, causing significant cuts to social services and public education. In addition, Illinois has more than $14 billion in unpaid bills and has faced numerous bond downgrades. As the deadline loomed Wednesday afternoon, it seemed unlikely that lawmakers would come to an agreement. House Republican leader Jim Durkin told the Chicago Tribune he did not think the two parties would find common ground before recess. He also blamed Democrats for trying to tarnish Rauner as he seeks re-election. For Brown, whose family has suffered with mental illness, passing a progressive budget is “very personal.” Though he is not from Illinois, Brown said he wanted residents to have adequate mental health resources. FEI has put forward a budget of its own that would close corporate tax loopholes, implement a progressive income tax and pass a small sales tax on LaSalle Street transactions. With additional revenue, the budget would increase spending on social services, higher education and environmental measures.